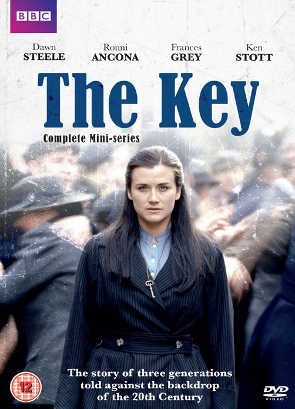 Donna Franceschild’s 2003 BBC miniseries The Key has been released on DVD at an interesting time for the trade union and labour movement. After the changes in the Labour party under Tony Blair and subsequent leaders, the election of Jeremy Corbyn provides an interesting postscript to the viewer and raises further questions about the role of women in the modern political labour movement. The Key follows three generations of female activists in Glasgow, both in their roles in the movement and their home lives. Mary Corrigan (played as a young woman by Dawn Steele and from her 50s by June Watson) works in a factory during World War I. After the factory management dismisses the ill effects the work has had on Mary’s health, she falls in love with socialist-minded engineer Duncan (Kevin McKidd). Eventually, she becomes more active in organising the women in her factory into a union and devotes her life to the union movement as she witnesses police violence, from Glasgow in 1919 to the miners’ strike in Orgreave in 1984. In between, Mary deals with the death of Duncan in World War I, and raising her daughter, Helen, without the support of her abusive husband Billy (Ken Stott). The programme alternates between Mary’s journey and the stories of her granddaughters, Maggie (Ronni Ancona), a New Labour candidate for Parliament, and Jessie (Frances Grey), a call centre worker eager for promotion to support her two sons. The two sisters are clearly meant to demonstrate the variety of ways the Thatcher era disillusioned workers, with Maggie viewing access to power as the only method to be able to make a difference within the movement. Jessie attempts to avoid any kind of political involvement, understanding the message from her employers that promotion is dependent on a meek attitude and willingness to work constant overtime. Multigenerational epics are nothing new, but it’s particularly exciting that The Key chooses to focus on the women of the Corrigan family. With the exception of Jessie’s childhood sweetheart Danny (Stephen McCole), a care worker campaigning against increased privatisation, the male characters take a background role. It can still be difficult to find films and series that pass the Bechdel test; The Key’s focus on the female characters, particularly in a story about labour and unions, rather than specifically “women’s issues”, is refreshing. Yet the length of The Key has meant the series hasn’t got much time for character development. For example, the character of Helen, sandwiched in between mother Mary and daughters Jessie and Maggie, loses the most in terms of focus. Helen has been raised in a home with an erratic, abusive father and eventually marries charismatic Communist shipyard worker Joe Rossi (Ewan Stewart). When Joe is injured in an accident due to workplace negligence, Helen is forced to go back to work as a cleaner, leaving her mother to care for her two young daughters. I am fascinated by Helen. Throughout the show, she and her husband are consistently shown to have a genuinely loving partnership and I find myself wanting to know more about her experience of dealing with the after effects of growing up in a home with domestic violence in order to form a marriage based on trust, giving Helen and Joe the ability to cope with his debilitating accident. In the segments taking place in 1997, Helen has gone from being a cleaner to full-time regional organiser. The series never alludes to the difficulties of that career rise during the 1980s, particularly for a woman with caring responsibilities. Indeed, I find myself wishing we could see more of Helen’s life, rather than feeling like she is simply serving as a foil for her daughters. Would Maggie have been an MP supporting Corbyn’s election? Similarly, it is mentioned that Maggie used to be an employment lawyer, helping those harmed by corporations, before becoming a local councillor and then a New Labour MP hoping to make a difference. When Helen confronts Maggie about some of the decisions she’s made, Maggie angrily argues that she’s seen her losing arguments with the government all her life; the only possibility for reform she sees is changing the parliamentary party from within. The series clearly disapproves of this mindset, treating Maggie as well-meaning but naïve. Maggie’s career as an employment lawyer (which, as mentioned, lead to these decisions) is never explored, nor is the brief allusion to her ex-husband’s family’s Conservative background extended beyond a single wedding scene. The series focuses on the ill effects of a specific bill Maggie has sponsored, rather than understanding why she feels that it’s a necessary step. The series writer Donna Franceschild clearly has strong views about the importance of a strong union movement but, at times, the characters feel less filled in beyond their politics. Watching the series after the election of Jeremy Corbyn as Labour leader is an interesting postscript (would Maggie have been an MP supporting Corbyn’s election? ), but it serves as a reminder of the divide between female activists at the grassroots level and those participating in the leadership. Both Maggie and Helen are greatly helped in their political ambitions by the support of their mothers, who are willing to accept part of the caring responsibilities for their young families. While Corbyn’s shadow cabinet appointments have included more female appointees than ever before, there has been comment over the lack of the prominent positions held by women. There are similar gaps in the leadership of trade unions. Through the participation of the Corrigan women in the major events through the 20th century, Franceschild is reminding viewers that behind the famous political figures of the time, hundreds of women have formed the backbone of the trade union movement: still an incredibly relevant lesson today. [Image description: Cover of recent DVD release of The Key, supplied by SimplyMedia and shared under fair dealing. 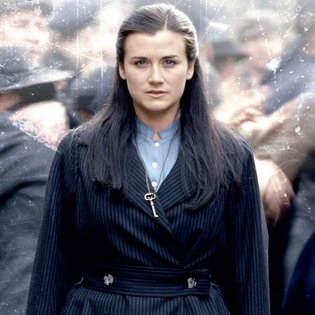 This shows a head, shoulders and hip shot of the young Mary (Dawn Steele) standing in front of a blurry crowd and looking straight at the camera with a look of intensity and readiness. She wears a dark blue belted striped jacket with a light blue shirt and a silver key pendant necklace. The purple and white BBC logo is in the top left corner, while the names Dawn Steele, Ronni Ancona, Frances Grey and Ken Stott are written (in black) at the top of the design just underneath this, with “The Key” (in large navy lettering) and “Complete Mini-series” (smaller black lettering) underneath that.